The alignment, stability, handling and performance of a vehicle depend on many factors. One of the most important aspects of these characteristics is the design of the suspension and steering systems. 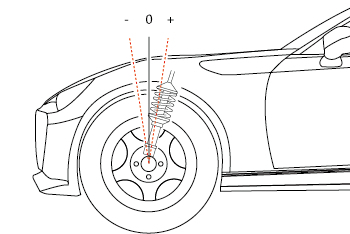 Suspension geometry is defined as: "The angular relationship between the suspension, the steering linkage and the wheels - relative to the road surface." The suspension geometry for any given vehicle is a result of the design development of the vehicle and the design. 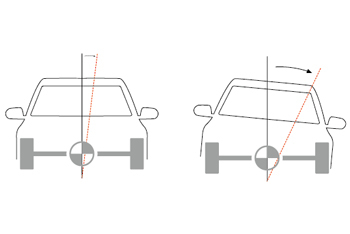 Camber is the inward or outward tilt of the wheels when viewed from the front of the vehicle. The amount of tilt is measured in degrees from the vertical and is called the camber angle. If the wheel tilts out at the top, the camber angle is positive and if the wheel tilts in at the top it is negative. Camber alters the handling qualities of a particular suspension design; Negative camber usually improves grip when cornering. This is because it places the tire at a better angle to the road, transmitting the forces through the vertical plane of the tire rather than through a shear force across it. HARDRACE adjustable camber kits allow you to set the camber correctly and easily. Caster is the angle of the front strut when seem from the side of the vehicle. 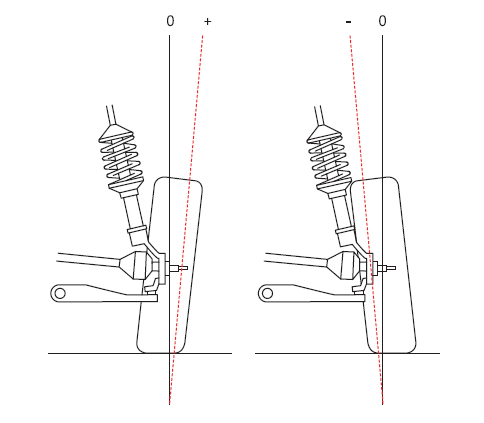 If the steering axis is tilted rearward, it is called "Positive Caster". A forward tilt is called "Negative Caster". Generally speaking, positive caster can increases stability at high speeds. Positive caster also causes increased steering effort at low speeds. Having to run less static camber improves traction, reduces tries wear and improves the cars potential braking abilities through improved grip. In addition to increased high speed stability, cornering is enhanced and steering wheel return ability is improved by positive Caster. This generates additional feedback so giving the driver more communication with what the tries are doing. HARDRACE adjustable caster arms help you to adjust caster accurately. Toe is measured at the center of the wheels from one wheel rim to the other. When the distance is greater at the rear of the wheels, it is called toe-in. 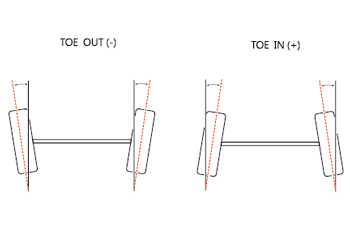 When the distance is greater at the front of the wheels, it is called toe-out. In other word, Toe in is the measurement between the leading edge of the front tires as compared to the trailing edge of the same tires. For example, in a rear wheel drive car, increased front toe in can provides greater straight-line stability at the cost of some sluggishness of turning response. The wear on the tires is marginally increased as the tires are under slight side slip conditions. HARDRACE adjustable rear toe arms allow you to set the rear toe as required, be it toe in to generate heat more quickly and increase turn in stability or toe out to make the car more nervous and quicker to change direction for drifting or tight circuit work. A sway bar or anti-roll bar is a part of car suspension that helps reduce the body roll of a vehicle during fast cornering. It connects opposite (left/right) wheels together through short lever arms linked by a torsion spring.